We just released General Report — a new feature that will allow you to filter your tickets in many ways and generate custom reports and statistics. You can easily filter tickets by team members, tags, color, etc. and see metrics like the ticket closing time or time spent in each stage. You can even include ticket Notes into the report. As with Performance Report, there is CSV/Excel export and print view. 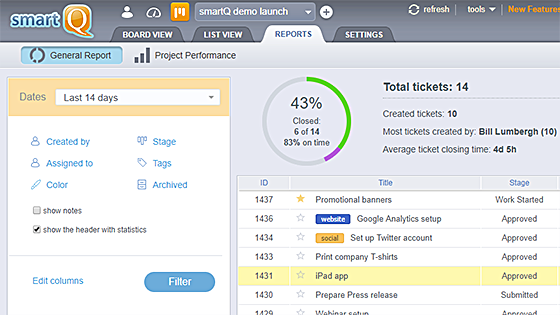 Check General Report now and see how it can help you get a better overview of your projects. Previous post: Automation updates: new Actions and more!